Medieval psalters were made to be used either for personal devotion or in church services, including the offices or daily cycle of prayers recited by monks. The Glenorchy Psalter was used in a monastery in Argyll, in Scotland, before the Reformation, but by the first quarter of the 16th century it was owned by the 3rd earl of Glenorchy, Colin Campbell. Its calendar, an aid to the manuscript's users in planning prayers and readings for services, lists many saints who were revered in western Scotland. A copy of the Book of Psalms would be divided into sections according to one of four medieval traditions. 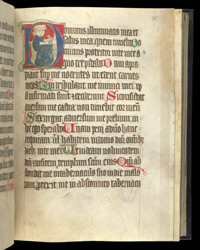 The Glenorchy Psalter has the ten-fold divisions, which divide it according to the distribution of the psalms for early morning prayers (matins) for the seven days of the week with an eighth section for the evening prayers (vespers) plus an ancient Irish division which adds two to the total divisions. Psalm 26 / 27 ('The Lord is my light') begins the second section. The division is indicated by the large decorated first letter. It bears a picture of a monk or possibly David, the author of the Psalms, writing at a desk. In his left hand, he holds his inkwell and in his right his neatly trimmed quill.